Zinedine Zidane is targeting another Chelsea star, N'Golo Kante, alongside Eden Hazard. According to the English outlet, Evening Standard, Real Madrid are eyeing a move for Chelsea stars, N'Golo Kante and Eden Hazard, in the upcoming summer window. 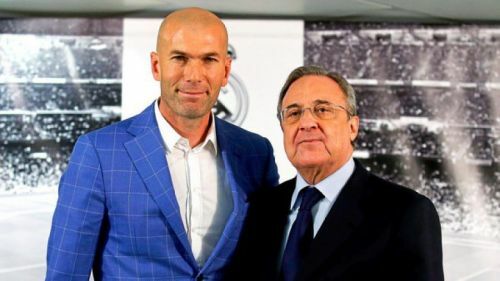 Zinedine Zidane, who has been re-appointed as the Madrid boss with the duty of rebuilding the Real Madrid side after a disappointing campaign, will be looking to land the Frenchman with a view of strengthening the Los Blancos' midfield. Chelsea FC's talismanic forward, Eden Hazard, has openly admitted his desires to represent the Royal Whites on several occasions. Besides, the arrival of his idol, Zinedine Zidane, would act as a catalyst in the Belgian's exit from the Stamford Bridge. On the other hand, N'Golo Kante, who is often regarded as the best defensive midfielder in the world, has been playing in a different role under the current Chelsea boss, Maurizio Sarri. With Real Madrid's stance to make a move for Brazilian forward, Neymar Jr, surrounding the future of Eden Hazard, it would be a tough choice for the Real Madrid hierarchy to choose between the two. However, Zidane, himself is known to be a great admirer of the Belgian talisman. On the other hand, Los Blancos' defensive struggles throughout the season have led them to bring a new face in their squad – that's where N'Golo Kante's name strikes in their wishlist. However, the Frenchman who has become a vital part of the Chelsea squad since his move from Leicester City in 2016, has signed a new five-year deal with the Blues making him the highest-paid player in their squad. Apart from that, the Premier League giants would be reluctant to let the Frenchman leave amidst their two-year transfer ban imposed by FIFA. With Borussia Dortmund's Christian Pulisic already signed as a replacement, Eden Hazard is more open to a Bernabeu than the World Cup winner. Eden Hazard's move to the Spanish capital seems more of a possibility at the moment. N'Golo Kante, on the other hand, is less likely to move to the Spanish capital as the Blues face a transfer ban.